This promotional pen features chrome accents. Get executive style with a stock safety & construction theme on the barrel of this custom pen! This custom logo pen features a pro-grip for comfort and smooth writing that Scripto is known for. Retractable curvy plastic barrel ballpoint promotional pen with patriotic theme American flag stock art grip. Retractable curvy plastic barrel ballpoint promotional pen with cloud theme stock art grip. A custom pen with a detachable neck cord is the perfect tradeshow handout. Promotional pen with translucent barrel and silver teardrop accent on matching color grip. Promotional ballpoint pen with bright jewel-tone rubberized comford grip and black ink. Get a grip on your promotions with this promotional pen featuring a clear frosted barrel and colored accents. Keep track of your appointments by writing them down with this retractable custom stylus pen! Plunger action retractable ballpoint promotional pen has popular contoured design. An inexpensive promotional pen with a comfort grip. Comfort grip promotional pen with blue ink. Smooth curve matte silver promotional pen with bold color rubber comfort grip. This two in one custom imprinted pen features a pen on one end and a highlighter on the other. Comfortable and stylish, this Colored Click Promotional Pen w/ Rubber Grip is sure to be a hit at your next event! Choose from 7 on trend colors. If you are looking for a promotional giveaway that will draw instant attention to your brand, then these full color ballpoint custom pens are it! Go for a modern look with a Custom Pen that's inspired by America's favorite spotted dog. Get executive style with a stock cow theme on the barrel of this custom pen! With four different inks this promo pen makes an out of this world giveaway. A retractable style custom pen that will add a little pizzazz to your promotions. A hot promo pen with bold color choices and a curvaceous barrel. Add a little glamour to your promotions for a great low price with this custom imprinted pen featuring a diamond studded grip. This popular turn of the century style plastic custom imprinted pen is an excellent addition to your next promotions. Your logo will stand out on any of the bright translucent barrel colors on this promotional pen. Make a statement with your next promotion with this colorful Geometric Grip Promotional Ballpoint Pen! It comes in 5 different colors and features chrome accents. Feel like royalty when you write with the Regal promotional pen. The Promo BIC WideBody Chrome Imprinted Pen, with soft, ergonomic rubber grip, features an extra large imprint area to promote your logo. When you want to write without regret and promote your brand in the "write" way, then these amazing custom pens with erasable ink are what you want. 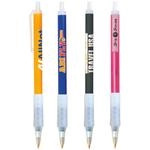 A click action style custom pen that will add a spot of color to your promotions. Add a splash of color to your promotions with the brightly colored Drake Custom Imprinted Pen. Show off your logo on this translucent promo BIC custom pen with white frosted trim. Make writing easy on your hands and promotions easy on your budget with this Promotional pen. Promo BIC Tri-Stic WideBody custom pen is three times better than your average promotional pen. This Illuminated Logo Metallic Custom Stylus Pen features 2 imprints, and ensures your logo is seen by lighting up! Your laser engraved branding illuminates when you place the cap on the back of the pen. Get your brand’s name out there with great presidential custom pen! Your logo will pop on the white barrel of the Sharon retractable promotional pen. Durable and bright, this Translucent Promotional Ballpoint Pen w/ Metal Clip will become your recipients new favorite pen! It comes in several eye-catching colors and features smooth writing black ink. Feel the comfort of the rubber grip while maximizing your message with a Promo BIC WideBody Imprinted Pen. Show off your logo on this translucent promo BIC imprinted pen with white frosted trim. An hourglass shaped custom pen with a colored barrel that makes your logo stand out. Get more for your money when you market your company, team or event with these budget-friendly custom pens. 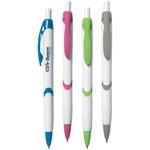 These click action promo pens are available in pastel tone colors for a softer look. Featuring smooth writing black ink, this Soft Touch Rubberized Custom Ball Point Pen is lightweight making it comfortable to write with. Choose from 9 unique colors to really make your branding stand out. The splash of color will make your logo stand out on this custom pen with colored accents. These straightforward translucent colored customized pens are great for your promos and budget. The tropical barrel color of this custom pen will make your promos stand out from the crowd! An hourglass bodied custom pen that adds a dash of color to your promos. 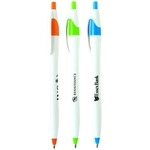 All eyes will be on your logo when imprinted on these neon colored customized pens. Get a grip on your promos with these classy and curvaceous custom pens. This unique Soft Touch Rubberized Custom Stylus Pen comes in a variety of fun colors, and features a stylus tip that will help keep screens smudge free. The sleek body provides a comfortable grip. The bold colored barrel of this custom pen will make your promotions stand out from the rest. Frisco Click Promotional Pen with colored clip and accents on the tip and middle. When you combine two great products into one, you get BIC Rize stylus custom pens that will showcase your custom logo for unbeatable brand exposure. A fun and playful Two-Tone Rubberized Custom Pen will highlight your imprinted company brand and give you the advertising you deserve. It features a plunger action mechanism and smooth rubber finish for comfortable writing. Make a colorful statement about your brand and offer these great BIC Super Media Clic custom pens at your next event. This plunger action Slim Element Translucent Promotional Pen comes in a variety of fun eye-catching colors! It features smooth writing black ink with a medium point. These silver or color Contour Custom Pen w/ Rubber Grip feature a click action mechanism ideal for a hard working businessman. MaxGlide custom pen features a newly formulated hybrid ink that provides a gel experience with the consistency of a ballpoint! Clean modern design and functionality have come together to create these Image custom pens in a brand that is recognized and used worldwide.